Photo by Dave Smith, © 2003 UCMP. The name says it all. This group of huge carnivores must have tyrannically ruled the land during the last part of the Cretaceous, 85 to 65 million years ago. Short but deep jaws with banana-sized sharp teeth, long hind limbs, small beady eyes, and tiny forelimbs (arms) typify a tyrannosaur. The Tyrannosauridae included such similar animals (in rough order of increasing size) as Albertosaurus, Gorgosaurus, Daspletosaurus, Tarbosaurus, and of course Tyrannosaurus rex. 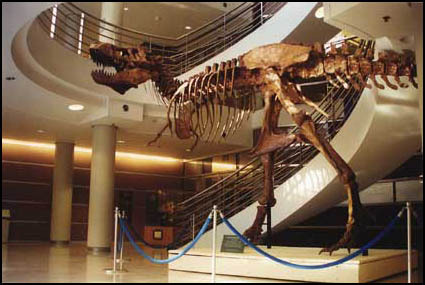 A tremendous skeleton of Tyrannosaurus now stands guard in the Valley Life Sciences Building, which houses the UCMP and the Department of Integrative Biology at UC Berkeley. Tyrannosaurs belong to the Saurischia, or "reptile-hipped" dinosaurs. Within the Saurischia, tyrannosaurids belong to the group of carnivorous dinosaurs known as theropods. Traditionally, the tyrannosaurs have been included within the Carnosauria. In this classification scheme, carnosaurs represent the largest carnivorous animals to ever walk the land. However, recent work has shown that tyrannosaurs are in fact a highly derived group of coelurosaurs, which is mostly composed of smaller animals (including the smallest of all non-avian dinosaurs, the crow-sized Compsognathus, and also the birds). Since tyrannosaurs were so huge, you might ask how they could move well and hunt prey? In the dinosaur movie Jurassic Park, T.rex is depicted moving extremely quickly, maybe 50 or 60 mph, isn't it? Is this reasonable? For a more in-depth discussion of this, see our dinosaur speeds site. Recently, scientists studied Jurassic Park to calculate the actual speed (using the length of the dinosaur's strides) of T. rex in the movie, and found that it was actually moving at a walking speed of about 10-12 mph (the jeep in the movie was supposed to be moving at about 40mph)! Your eyes are easily deceived by speeds, especially when movie magic is used to dramatize them. Many scientists familiar with the principles of biomechanics (physics applied to living organisms) think that tyrannosaurs could move fairly fast, maybe 10-20 mph, but not as fast as the smaller theropod dinosaurs. 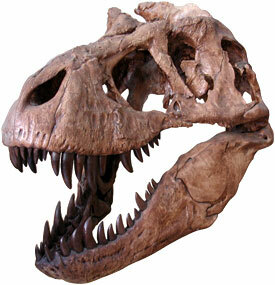 Smaller tyrannosaurs like Albertosaurus or young individuals may have moved faster than the bigger ones like T. rex. Yet we still lack any clear evidence that tyrannosaurs could even run; some think that their body size limited them to only a fast walk, like an elephant. Trackways that unambiguously were made by tyrannosaurs would clarify the matter, but so far these are not known, apart from one probable footprint. Tyrannosaurs are surprisingly common in many North American fossil beds, especially their large, serrated teeth, which they shed periodically like most archosaurs. The teeth of tyrannosaurids are very interesting  rather than being the flat knifelike blades as in most other carnivorous dinosaurs, they are, as Berkeley's Professor Kevin Padian describes them, "like lethal bananas;" more like giant spikes than razor-edged blades. With a mouthful of this murderous fruitlike dentition, tyrannosaurs had a whopping bite, which might have made up for their reduced forelimbs. The bite marks of these teeth are quite recognizable on some dinosaur bones. Some tyrannosaur fossils show evidence of bite marks from other tyrannosaurids, suggesting that there might have been fierce fighting between tyrannosaurs, or even cannibalism. Just about two dozen good specimens of these animals have been found and these finds are from highly restricted areas in western North America. Henry Fairfield Osborn, of the American Museum of Natural History in New York City, first described Tyrannosaurus rex in 1905. This first specimen of Tyrannosaurus is now on display at the Carnegie Museum of Natural History in Pittsburgh, Pennsylvania. The skeleton on display at UCMP is a cast of a skeleton (excavated in 1990) now in the Museum of the Rockies in Bozeman, Montana. Berkeley's mount is 90% complete, one of the best specimens found to date. Some 1520 other specimens around the country range from about 10% to 80% complete; missing ribs and tail bones are common. A current topic in paleontology that has received much popular press is the question of whether T.rex (or other Tyrannosauridae in general) were predators or scavengers. Let's explore this issue. Paleontologist Jack Horner of the Museum of the Rockies (Bozeman, MT) has proposed that T.rex could not have been a predator. His arguments against predation include its small eyes (needed to see prey), small arms (needed to hold prey), huge legs (meaning slow speed) and that there is no evidence for predation  bones have been found with tyrannosaur teeth embedded in them or scratched by them, but so far no study has shown that tyrannosaurs killed other dinosaurs for food (a bone showing tyrannosaur tooth marks that had healed would be strong evidence for predation). His evidence supporting scavenging include its large olfactory lobes (part of the brain used for smell), and that its legs were built for walking long distances (the thigh was about the size of the calf, as in humans). Vultures have large olfactory lobes and are good at soaring to cover long distances. There are arguments against scavenging. Most large living predators (such as lions and hyenas) do scavenge meat happily when it is available, but most do prefer fresh meat. Horner argues that its arms were too weak to grab prey, but sharks, wolves, snakes, lizards and even many birds are successful predators without using their forelimbs (if any). Whether T.rex was a slow animal is tough to tell, as our dinosaur speeds page will tell you. What is the public to think of all this? It is suggested that you make up your own mind; the fact is that reconstructing the behavior of extinct animals is difficult, especially when there are no close modern relatives with which to compare them. Tyrannosaurs may have been scavengers, predators or both; Horner is merely presenting an opposing argument that shows that we are not yet 100% sure what ecological niche the great tyrannosaurs filled. Tarbosaurus: Is it or isn't it a tyrannosaur? Tyrannosaurus rex is known only from western North America. However, an extremely close relative, Tarbosaurus bataar, lived in Mongolia at the same time that T. rex terrorized North America. 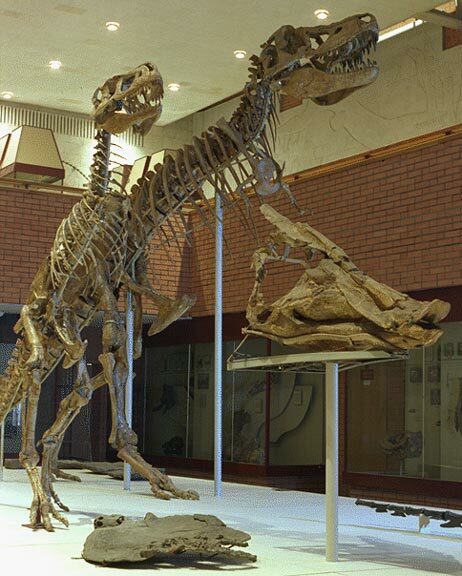 The two mounted skeletons in the picture are a juvenile and an adult Tarbosaurus from the Tsagan-Oola Formation of Mongolia, and are about 70 million years old. These skeletons are in the collection of the Paleontological Institute of the Russian Academy of Sciences in Moscow. In the foreground is a skull of another kind of dinosaur, the hadrosaur ("duckbilled dinosaur") Saurolophus angustifrons, also from the Upper Cretaceous of Mongolia, and a possible food item for Tarbosaurus. Some paleontologists feel that Tarbosaurus was so closely related to Tyrannosaurus that the two should be placed in the same genus. If this proposal is adopted, then Tarbosaurus will be renamed Tyrannosaurus bataar.